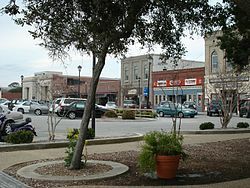 /ˈboʊfərt/ BOH-fərt) is a town in Carteret County, North Carolina, United States. Established in 1709, it is the third-oldest town in North Carolina. Fort Macon State Park contains the remains of Fort Macon, a 19th century coastal fortification. The population was 4,189 at the 2008 census and it is the county seat of Carteret County. It is sometimes confused with a city of the same name in South Carolina; the two are distinguished by different pronunciations. Beaufort is located in North Carolina's Inner Banks region. The town is home to the North Carolina Maritime Museum. It is also home to the Duke University Marine Laboratory (Nicholas School of the Environment and Earth Sciences), where scientists study the marine environment and develop solutions to conservation problems in coastal and oceanic ecosystems. Beaufort is located at 34°43′15″N 76°39′9″W﻿ / ﻿34.72083, -76.6525 (34.720729, -76.652569). According to the United States Census Bureau, the town has a total area of 3.5 square miles (9.2 km²), of which, 2.7 square miles (7.1 km²) of it is land and 0.8 square miles (2.1 km²) of it (22.82%) is water. As of the census of 2008, there were 4,189 people, 1,780 households, and 1,048 families residing in the town. The population density was 1,374.4 people per square mile (531.4/km²). There were 2,187 housing units at an average density of 797.1 per square mile (308.2/km²). The racial makeup of the town was 75.87% White, 19.99% African American, 0.11% Native American, 0.37% Asian, 0.05% Pacific Islander, 2.39% from other races, and 1.22% from two or more races. Hispanic or Latino of any race were 3.77% of the population. In the town the population was spread out with 18.3% under the age of 18, 7.3% from 18 to 24, 27.9% from 25 to 44, 26.7% from 45 to 64, and 19.8% who were 65 years of age or older. The median age was 43 years. For every 100 females there were 87.1 males. For every 100 females age 18 and over, there were 83.5 males. A horse drawn carriage in front of the North Carolina Maritime Museum. ^ "Town of Beaufort". http://www.beaufortnc.org/default.aspx. Retrieved 2009-08-18. ^ "A brief history of Beaufort, North Carolina". Beaufort Business Association. Archived from the original on August 1, 2008. http://web.archive.org/web/20080801032002/http://www.beaufortseaport.com/history.html. Retrieved 2009-08-18. ^ "Beaufort Sister Cities in Beaufort, North Carolina". Beaufort Sister Cities, Inc. http://www.beaufortsistercities.org. This page uses content from the English language Wikipedia. The original content was at Beaufort, North Carolina. The list of authors can be seen in the page history. As with this Familypedia wiki, the content of Wikipedia is available under the Creative Commons License.